LiveCode LessonsData GridLiveCode Data Grid Using The Built-In Field EditorHow Can I Select The Text in the Edit Field When It Opens? 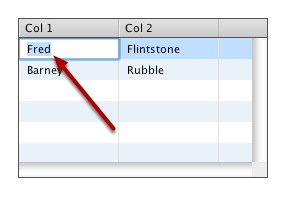 The default Data Grid behavior when editing cell contents is to put the cursor at the end of the field. This lesson will show you how to tell the Data Grid that all of the cell text should be selected. The technique described requires that you create a custom column behavior as outlined in this lesson. 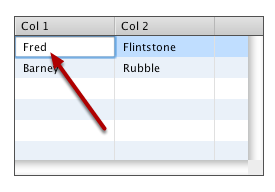 By default the Data Grid will not select the text of a cell when you start editing a value. You can tell the Data Grid to select all of the text by setting a special custom property called dgTemplateFieldEditor. If you set the dgTemplateFieldEditor["select text"] of the Data Grid to true then the data Grid will select the cell text. You can add this line of text to the EditValue handler in your custom column behavior. Just place the code right before the call to EditFieldText. Prev: How Can I Edit The Text as UTF-8, UTF-16 or HTML? Next: How Do I Save Changes The User Makes In An Editor Field To An External Data Source?